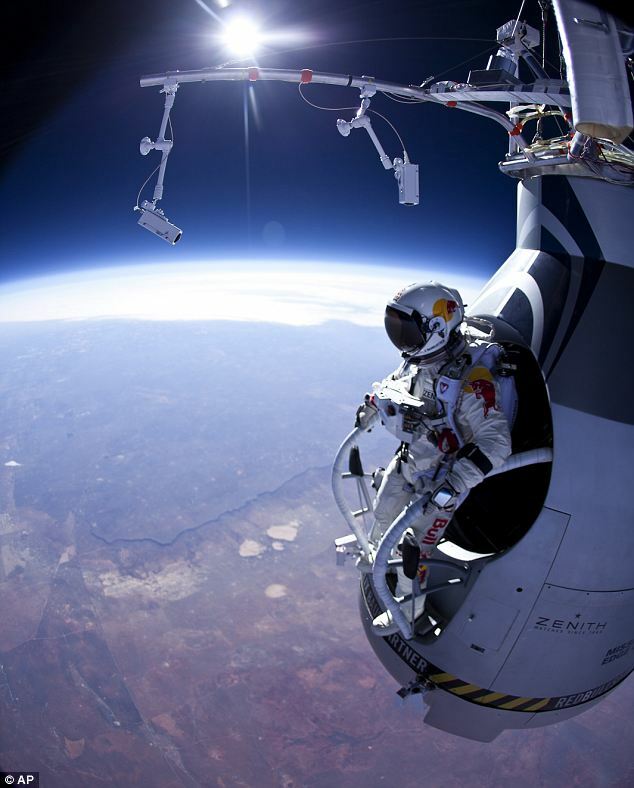 Felix Baumgartner is planning to skydive from a balloon at 23 miles altitude, 121,000 feet next week, October 8, 2012. He is hoping to break the speed of sound, 690 mph (1,110 kph) in freefall. I'm surprised he is planning on using a helium balloon, rather than a hydrogen balloon. Re: How high and fast can a person skydive from? How fast? What will the forces on his parachute be if he succeed breaking that sound barrier? Ahh, ok, now I see it, he will do it in thin air before the resistance of normal air slows him down. I did find it interesting the use of a high lift helium balloon. This does give hope to the idea of lighter than air space launches. If one chose to, presumably one could re-compress the lifting gas and recycle it. NS has a brief atricle. For those interested in the history, there is an excellent book, 'The Pre-Astronauts; Manned Ballooning on the Threshold of Space' by Craig Ryan, documenting ballooning efforts of the late 1940's through the mid 1960's. Are there actually insurance companies that will insure 24 mile, Mach 1 skydives? If the chute fails to deploy, insurance wouldn't help Felix Baumgartner much. One would choose to run the experiment on a clear, dry day. Obviously things could go wrong, but once 1000 feet or so in the air, he would have a good escape method. Notes are that the dive was successful, reaching Mach 1.24. If I remember right, when the first sonic booms were heard from experimental supersonic aircraft, those on the ground heard a deafening boom, fearing the worst that their plane had exploded. The pilots were unaware of the boom. Likewise, Felix Baumgartner apparently was unaware when he broke the speed of sound. Back of the envelope calculation, took some of the estimated data from the Baumgartner jump video (second column) from 39km height. No air resistance column is just acceleration due to gravity (9.8m/s2 = 35km/h/s). Last column uses a constant air density and terminal velocity of 1173km/h (just a guess from the video data). I've seen a few reports his fastest velocity was 1342km/h at 42 seconds, so I'm assuming the data in the video is off a bit. Jumping from higher would result in some high velocity. Neglecting air drag, free fall jump from 80km would result about 3000km/hour at Baumgartner's starting height of 39km after 90 seconds. I think that's getting close to the SR71 speed. I worked this out pretty quick, check my math, didn't spend time to put it in the table format, couldn't figure out how to paste it here. Used equations from here http://en.wikipedia.org/wiki/Free_fall. Glad Baumgartner is safe and sound on the ground! The higher you go the thinner the air, and the faster you will travel before you hit the thick air. The limiting factor is that if you drop from too high (say as high as the international space station), you are likely to burn up as your spacesuit hits the upper atmosphere at hypersonic speeds. Max speed in this calculation is about 10 seconds later than the measured value. Top speed in this freefall calculation is about 3000km/hour (1875mph), max deceleration is about 2 times g. Heat, I do not know how to calculate this, a few web sites report the SR71 went this fast through similar density air and max temp at the tip was about 340o C, polyimide (Kapton) can survive this. So, a pressure suit like Baumgartner’s with an additional layer of insulation and an outer layer of polyimide fabric (or whatever the IRVE-3 is made of). Keep in mind we are talking 10’s of seconds. Balloons won’t reach this altitude so you need to use a modified sounding rocket as the 10-16 g’s of typical sounding rockets is a bit much. Or maybe skydiving from SpaceShipTwo will become a rich person’s hobby? Another concern would be stability as both Baumgartner and Kittinger experienced spin control issues but somehow figured out how to stabilize the fall. Pretty amazing. Is it possible? Enjoy, I had a lot of fun playing with these numbers. (As always, this material is provided for entertainment purposes only. Not checked for errors or omissions. Godspeed!). I assume there is still some development going on with the space activity suits. However, this might have been an ideal situation to test it. Low pressure for a very short duration. How long was Felix open to the vacuum? A couple of minutes in the capsule, plus 4 minutes 19 seconds in freefall. the helmet/suit seal might not have had to be perfect for that duration, and the whole suit would likely have been much more comfortable. it's pretty cold up there, maybe with an extra pair of long johns. was the capsule heated? also, did he have a relief tube or mag pants? haven't seen any details. I've been kind of obsessed (in thought) with sky diving from the space shuttle since the Star Trek Voyager B'Elanna Torres Extreme Risk episode. If you had a retro-rocket to slow the orbital velocity substantially to zero could you simply drop a couple hundred miles and parachute to the ground? The data from the IRVE-3 experiment gives a pretty good idea of the conditions involved in such a jump. The IRVE-3 was an inflatable mushroom shaped heat shield about 3m in diameter, A=7m2,m=309kg, Cd=0.42. Surprise (to me), CdA/m for IRVE-3 is equal to that of the skydiver in the first air drag calculation above. Highest point for IRVE-3 was about 450km (280 miles), for the first part of the fall the velocity is pretty much v=t*9.8m/s2 and d=1/2 vt, so falling from 450km to 100km takes about 270 seconds and the speed at 100km is about 2.6km/s. 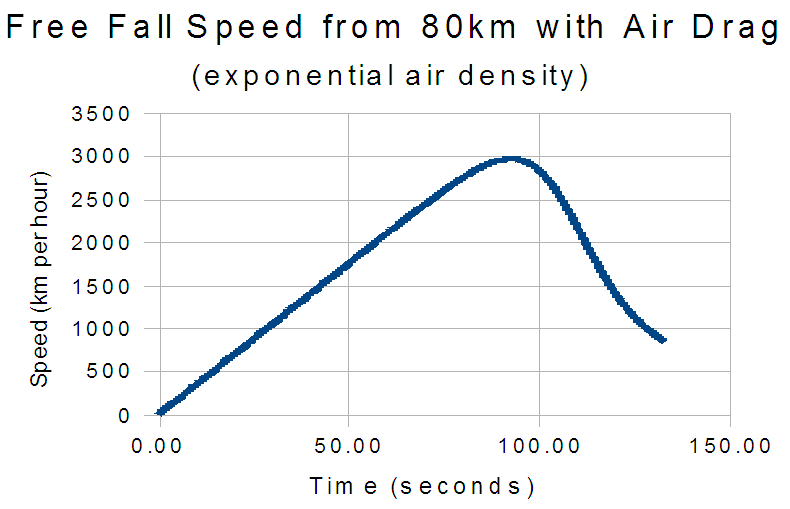 At 100km you can switch to the free fall with air drag equation, speed increases a little then a rapid deceleration with a max of about 20 times g at a height of 31km, this agrees with the NASA press release data. NASA reported a max temperature of 540oC (1000oF), I do not know how to calculate surface temperatures yet. The IRVE-3 was constructed from “Nextel Ceramic fabric” and “pyrogel insulation”. 6 minutes up, 14 minutes down. Anyhoo, I think you could make a spacesuit from such materials and survive the short duration temperatures involved, but the 20g force seems to be a real stopper (no pun intended). Maybe if you started with a cannonball posture then stretch out to the sky dive posture you could reduce the g forces a bit. Extreme, maybe a few 1000 years from now, RedBull X15. Fun stuff anyway. The inflatable heat shield is a good idea. One might be able to build a chair/harness as part of the heat shield, so one would be exposed to space (in one's space suit), but protected from the scalding heat behind the heat shield. The G force would be a function of the mass and profile. More mass, and a narrower profile, and one might be able to reduce the re-entry G-force from 20G to a more comfortable 5G. I think part of the problem is a big heat shield, and a lightweight reentry module. In one the earlier posts I said the calculation gave a max speed about 10 seconds later than the reported measured value, it was later reported the max measure speed was in fact 10 seconds later than the number give in the first press release. The free fall air drag equation is quite good in my opinion! As you might know, this is referred to as a halo jump. The military uses this. This is definitely on my bucket list! The terminal speed is determined by such factors as the geometry and orientation of the falling object, the composition and density of the air. All of this determines the drag force on the object. It's generally a complicated function of speed. The data from the IRVE-3 experiment gives a pretty good idea of the conditions involved in such a jump. The IRVE-3 was an inflatable mushroom shaped heat shield about 3m in diameter, A=7m2,m=309kg, Cd=0.42. Surprise (to me), CdA/m for IRVE-3 is equal to that of the skydiver in the first air drag calculation above. Highest point for IRVE-3 was about 450km (280 miles), for the first part of the fall the velocity is pretty much v=t*9.8m/s2 and d=1/2 vt, so falling from 450km to 100km takes about 270 seconds and the speed at 100km is about 2.6km/s. 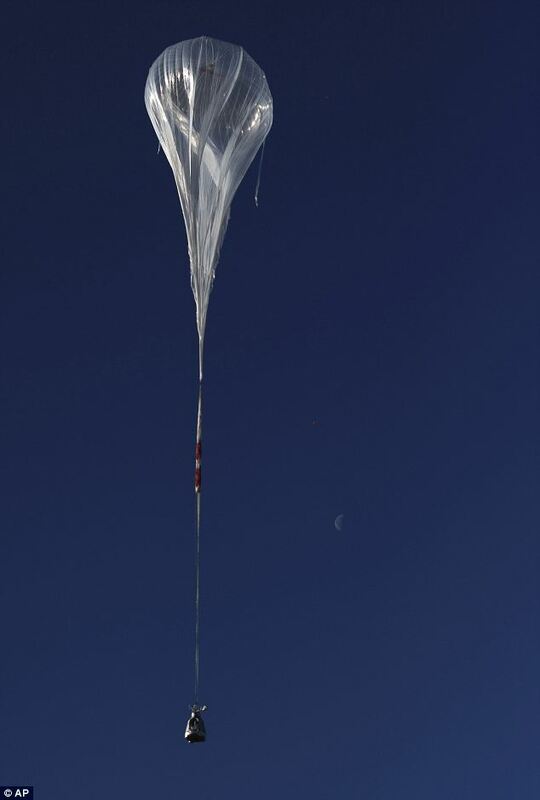 At 100km you can switch to the free fall with air drag equation, speed increases a little then a rapid deceleration with a max of about 20 times g at a height of 31km, this agrees with the NASA press release data. NASA reported a max temperature of 540oC (1000oF), I do not know how to calculate surface temperatures yet. The IRVE-3 was constructed from Nextel Ceramic fabric and pyrogel insulation. 6 minutes up, 14 minutes down. I tried to look IRVE-3 experiment up but had some trouble due to the government shutdown. I don't understand why a heat shield would be needed for a halo jump. Heat shields are typically used when objects having orbital speeds of about 7 km/s for low earth orbital satellites. Objects with that speed hitting an atmosphere would cause large amounts of heat on the body due to friction. Compare that to the speeds of objects in freefall from rest above the earths surface where v = 0 instead of 7 km/s. I don't understand why a heat shield would be needed for a halo jump. Hi Pete, agreed, not needed for HALO, this data was just available about the same time as the Baumgartner jump. I've played with these equations before but never had access to the experimental results. It's just a fanciful “what if” you did a free fall from orbital height but not orbital velocity. I was surprised at the similarity of the drag coefficient for the shield and a human body, just the way weight and area scaled. One of the IRVE-3 videos shows a view looking out from inside the heat shield, unlike the shuttle re-entry there weren't any ionization “flames” licking up around the edges, so it got hot but as you say nothing like orbital velocity, that's a lot of kinetic energy to dissipate. I think the IRVE-3 may be the first steps to make a lower cost re-entry vehicle for cargo or an emergency “life boat”. The article mentioned a device to change the center of mass, maybe to carry out “s turns” like the old STS. Heat is an issue and so is deceleration g forces. I think the space shuttle kept forces below 3g by “s turns”. I guess 6g's were seen during the Mercury program. If things go wrong and entry is too steep, 10g's or more: http://www.cnn.com/2008/TECH/space/04/19/skorea.soyuz/index.html . I'm an old guy, still remember the Mercury launches, X-15 flights, back then I would never have predicted the current state of affairs with government shut downs. Our biggest technological achievements now are in marketing, beanie babies, there's a real success story. We aren't where I thought we would be today. Page created in 0.216 seconds with 79 queries.